My father passed away when I was in college. Due to unexpected complications…one of my sisters and I were not able to travel back from college in the United States to Hong Kong to attend his funeral. 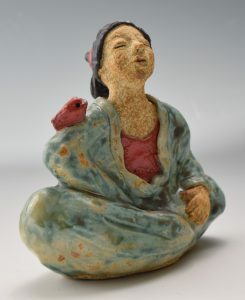 Then three years ago, my youngest sister saw one of my sculptures with a red bird on its shoulder and shared a story with me about that time. The day after my father passed away, a beautiful multicolor bird flew into our 19th floor condo. My family bought a cage for it and the bird lived there for a year before dying of cancer like my father did. Was it a coincidence or something else? In some ways my family was comforted by the thought that this unexpected beauty was brought into their lives during this time of sadness and helped them to grieve before it also departing from their lives. 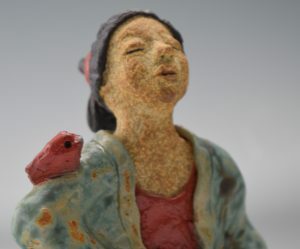 That story has left such deep impression on my heart that most of my sculptures have birds on one of their shoulders. To me the red bird represents a parent, a guardian angel, an adviser, a friend or the conscience that speaks to all people. I’ve even begun to include the red birds into some of my pottery and they’ve slowly become part of my signature pieces.